1. Lightly butter a medium bowl and set aside. In a small saucepan, combine the cream, corn syrup and sugar. Using a wet pastry brush, wash down the inside of the pan. Insert a candy thermometer. Bring the mixture to the boil over moderately high heat, occasionally washing down the inside of the pan with the pastry brush. Stir frequently to prevent scorching and boil until the mixture reaches 232. Remove the pan from the heat, immediately stir in the coconut and pour into the buttered bowl. Cover with plastic wrap, prick a few holes in the top and set aside on a rack to cool completely. 2. Divide the cooled coconut mixture in two. On a work surface, roll one piece into a 10” log. Flatten slightly to form a 10 inch by 2 1/2 inch rectangle. Arrange half the almonds, end to end and overlapping slightly, lengthwise down the center of the rectangle. Place half of the julienne ginger in a strip along one side of the almonds. 3. Slide a metal palette knife under the coconut rectangle to loosen. Bring together the long edges of the coconut rectangle over the almonds and ginger to enclose and pinch the seams to seal. Roll the log back and forth to make it smooth and even, making sure that the length does not exceed 10 inches. Transfer the log to a baking sheet lined with parchment and refrigerate. Repeat with the remaining coconut mixture, almonds and ginger. Transfer the second log to the baking sheet and refrigerate until firm. 4. Place the chocolate in a medium bowl. Set the bowl over a medium saucepan filled with 1/2 inch of simmering water and stir occasionally until the chocolate is melted. 5. Using a dry pastry brush, brush the top and sides of the coconut logs with melted chocolate. Refrigerate for a few minutes until hardened. Turn the logs over and brush the bottoms with the melted chocolate. Refrigerate until the coating is set and the centers are hardened, at least 20 minutes. 6. Place the logs on a work surface. Using a thin, sharp knife and cutting straight down, trim the ends of the logs. Cut each log crosswise into ten 1-inch slices. Let the sushi come to room temperature before serving. 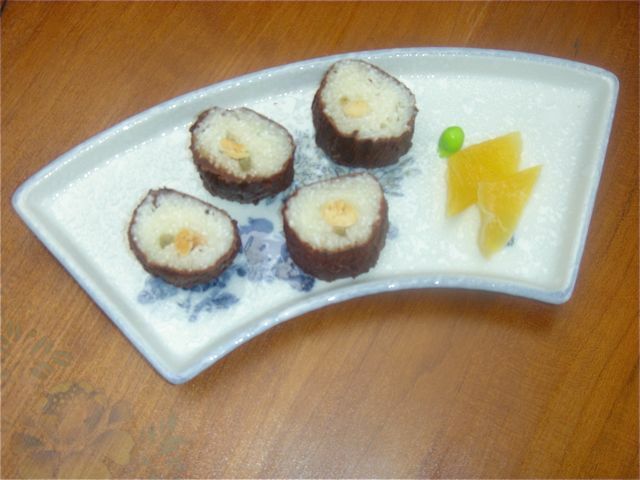 The sushi can be stored in an airtight container for up to one week in the refrigerator.